CD Archiver. 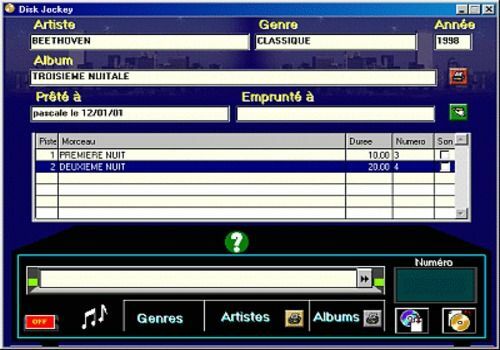 Possibility to create an artist, genre, album, the latter containing the different titles, their duration, a wav file that can be created or loaded when creating the CD, and a search number. Possibility to search either by this number or by one or more words. Printing of the list of artists, albums or detailed content of an album is possible. Management of loans and borrowings. All My Movies is a software specially created to manage your media collection. IMDB support and the ability to capture your movies as files.